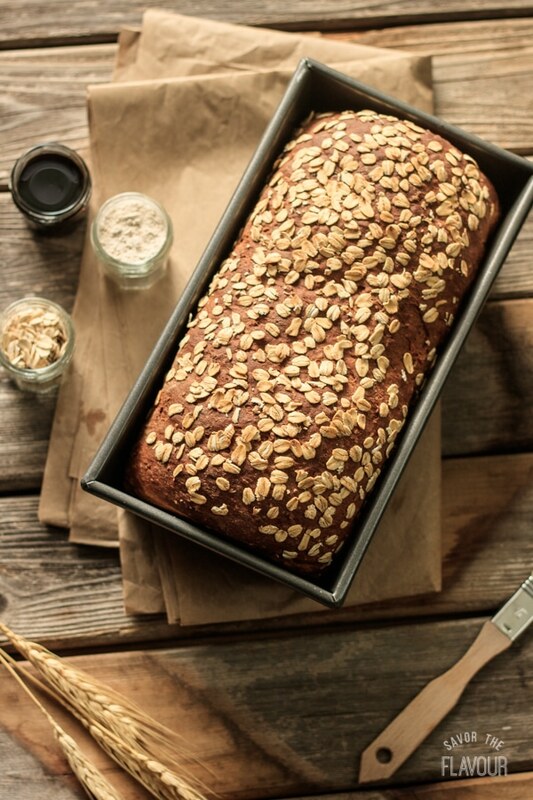 This healthy multigrain bread recipe is perfect for sandwiches or alongside a cozy bowl of soup. 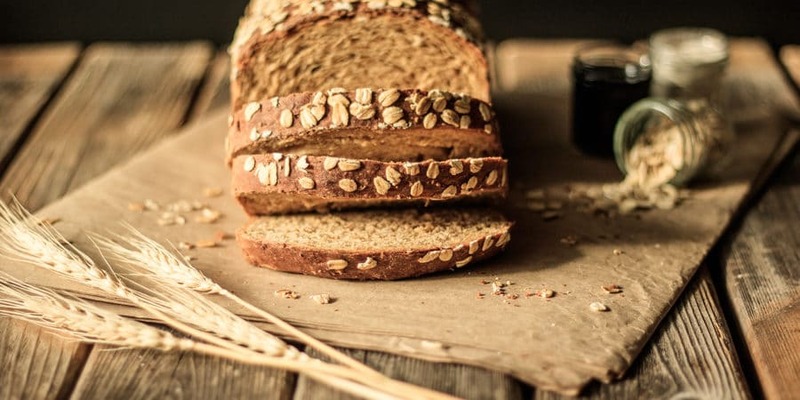 Boost your health with lots of grains in this crusty homemade bread. No mixer required! In this recipe, I used Bob’s Red Mill 10-Grain Bread Mix as one of the dry ingredients. 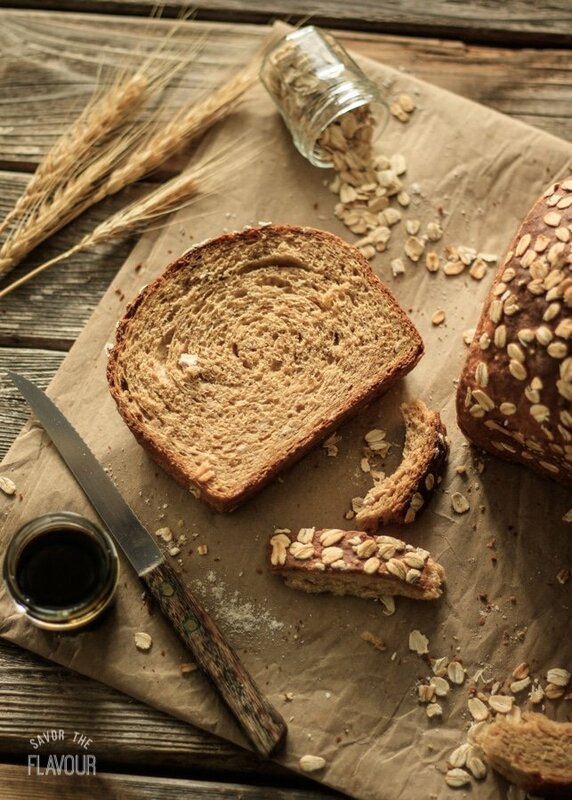 If you can’t find the bread mix in your grocery store, substitute with a multi-grain hot breakfast cereal, like Red River cereal or Bob’s Red Mill 7 Grain cereal. Please note, the following instructions only apply if you are doing the cereal substitution. Put 1 1/2 cups of dry cereal into the mixing bowl and boil 1 1/2 cups of water. Pour the boiling water over the dry cereal and let it sit until it has cooked and cooled to about 110-115 F. When you add the flour, you may not need to add any water, but add some if necessary. The dough should be slightly sticky, not dry. One notable feature of this recipe is its unique smell when baking. 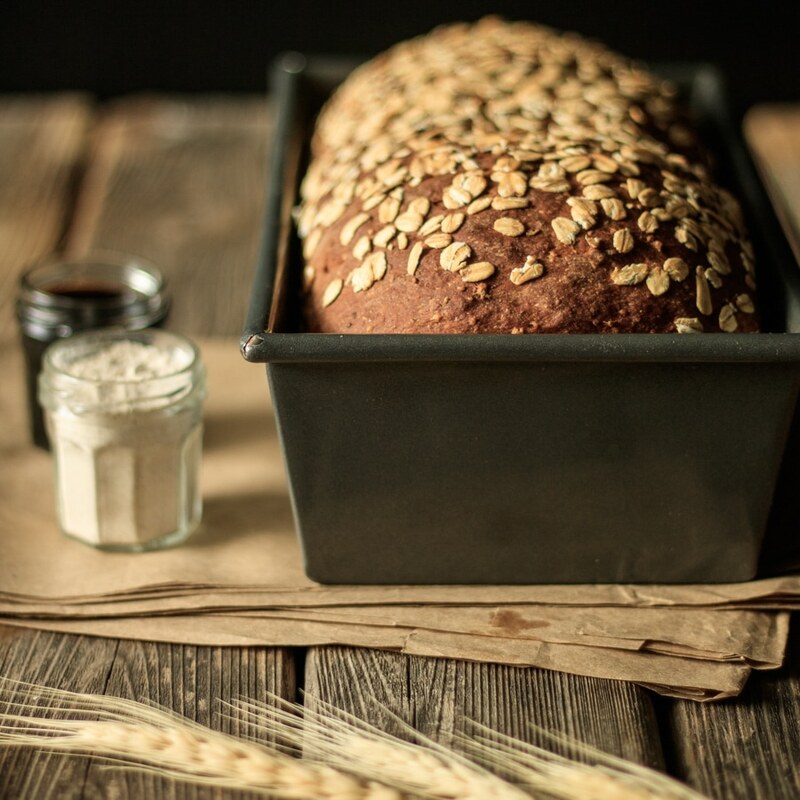 You’ll enjoy the fragrance of the grains cooking with the molasses. Molasses + bread = deliciousness! Measure the flours and grains with a kitchen scale. It’s easy to pack the flour into the measuring cups, giving an inaccurate measurement. Speed up the proving time by putting the bread in a warm place. Put the bowl of dough in a cold oven, then place a metal pan of boiling water on the shelf below the dough. The steam will gently warm the oven, encouraging the dough to grow. 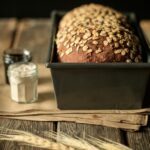 Spritz the loaf with water before topping with the oats. The damp surface helps the oats stick to the dough much better. Store leftover bread in a plastic bag at room temperature. The fridge will make the bread go stale really quickly. For long term storage, place in a freezer bag and freeze. Put the bread flour, 10-grain mix, whole wheat flour, and rolled oats into a large mixing bowl. Add the salt and yeast on opposite sides of the bowl and stir in each with your finger. Pour in the melted and cooled butter and the molasses. Add about half of the water and stir it with your hand. Gradually add the rest of the water until all the flour is picked up from the bowl and a slightly sticky dough has formed. Turn out the dough onto a lightly floured surface and knead for 8-10 minutes, until the dough is no longer sticky and is smooth and stretchy. Form the dough into a ball, place in a large buttered bowl, and cover tightly with plastic wrap. Leave it to prove until at least doubled in size, about 1 1/2 to 2 hours. Butter a 9″ by 6″ metal loaf pan. Turn out the dough onto a lightly floured surface and shape the dough into a rough rectangle about the width of the long side of the loaf pan you will be using. Roll the dough up into a very tight log and pinch the seam to seal. Lightly spritz the top of the loaf with water from a clean spray bottle, or brush the loaf with a wet pastry brush. Spread the rolled oats onto the work surface and roll the wet part of the loaf over the oats to coat. Place the loaf oat-side up in the pan, cover with buttered plastic wrap, and let it prove for 45 minutes to 1 hour, until the dough barely springs back when pressed lightly with a fingertip. About 10 to 15 minutes before the loaf is fully risen, preheat the oven to 400 F.
Remove the plastic wrap and bake at 400 F for 15 minutes, then lower the temperature to 375 F and bake for about 30 minutes. If the loaf starts to get too dark on top, cover it with foil. The loaf is done baking when it is well browned on top, bottom, and sides, sounds hollow when thumped on the bottom, and has an internal temperature of 190 F.
Turn out the loaf onto a wire rack and let it cool for about 2 hours before serving. Substitution only: If you can’t find Bob’s Red Mill 10-Grain Bread Mix, you can use a multi-grain hot breakfast cereal like Red River cereal. Put 1 1/2 cups of dry cereal into the mixing bowl and boil 1 1/2 cups of water. Pour the boiling water over the dry cereal and let it sit until it has cooked and has cooled to about 110-115 F. When you add the flour later, you might not need to add any water. The dough should be slightly sticky, though. This dough is more dense than a plain white bread dough, and may cause a stand mixer’s motor to fail. I recommend to almost always knead bread by hand, but if you choose to use a stand mixer, please be careful not to overload your mixer. This bread is quite filling with all of the grains inside. It tastes great fresh with a bowl of kale and quinoa stew, and the next day toast it to use in tomato sandwiches.